Union Minister for Environment, Forest and Climate Change, Harsh Vardhan Friday stated that it is our collective responsibility to do our duty and protect the rights of children of future generations. In the run-up to World Environment Day 2018, Union Minister for Environment, Forest and Climate Change, Harsh Vardhan appealed to the people to give up single use of plastic. Addressing a curtain raiser ahead of the World Environment Day on June 5 here the minister pointed out that the fight against plastic menace did not require any big actions, but only minor behavioural changes to adopt Green Good Behaviour. “Every individual has a Green Social Responsibility”, he said. The Minister stated that it is our collective responsibility to do our duty and protect the rights of children of future generations. He added that the celebrations are not a one-day activity, but a continuous process. 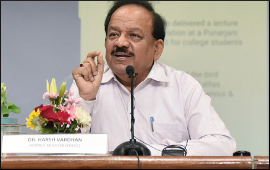 Vardhan exhorted the media to effectively wield the pen and educate, as well as urge people to adopt one Green Good Deed every day. He also emphasised that as part of World Environment Day celebrations, schools that become plastic-free will be awarded and issued certificates of being Green Schools. Highlighting the menace posed by plastic, Dr. Harsh Vardhan pointed out that 25, 940 tonnes of plastic waste is generated every day in the country, with 40% of plastic waste being uncollected and 60 million tonnes of solid waste is generated in one year. “Plastic bottle takes between 450-1000 years to decompose”, the Minister added.